SALEM, Ind. — Cody Coughlin last visited the famous high banks of Salem Speedway back in 2013, when he came away with his first CRA victory on his way to claiming the 2013 JEGS/CRA All-Stars Tour presented by Chevrolet Performance championship. 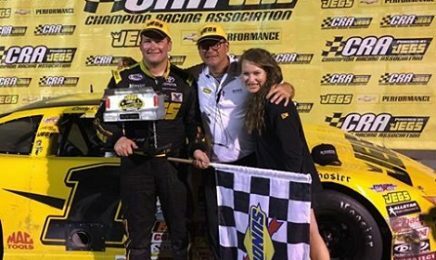 Coughlin came away with the same result in his second visit, getting the win in the Jay C Food Stores 100 JEGS/CRA All-Stars Tour event Saturday night at Salem Speedway. Coughlin broke the series track record earlier in the evening in Boyne Machine Company qualifying, a record Brandon Oakley had just set prior to Coughlin coming on the track. Coughlin drew the maximum 10 for the invert, putting him in the tenth place starting position. Coughlin worked his way to the front and passed Quinnton Bear on lap 67 to grab the lead, but had to fight off Jack Smith over several restarts in the closing laps of the race before going on to get the victory, his fourth CRA win of the season to go along with three ARCA/CRA Super Series wins. Dakota Stroup got a series high third place finish and earned the FLUIDYNE High Performance Cool Under Pressure Award. Trevor Berry would hold on to get a fourth place finish, while Phil Bozell would finish fifth. Brian Bayer won the stock car feature and Todd Whitfield topped the pure stock class.